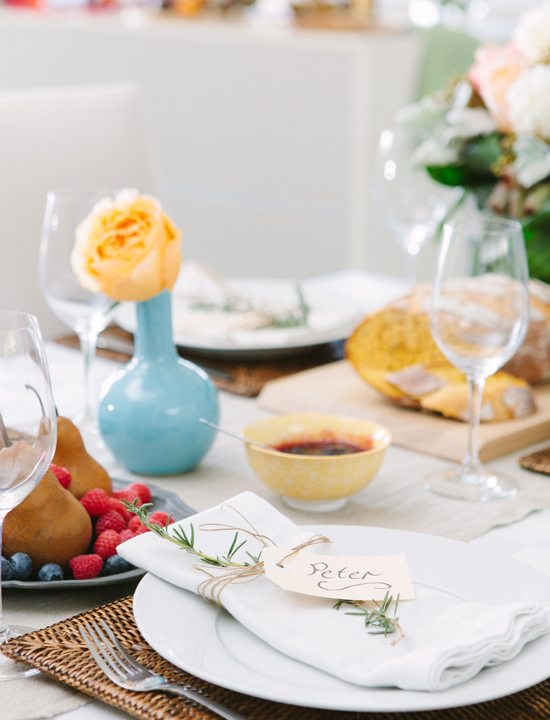 'Tis the season for entertaining, and we are here to tell you creating a beautifully decorated table is easier than you think. 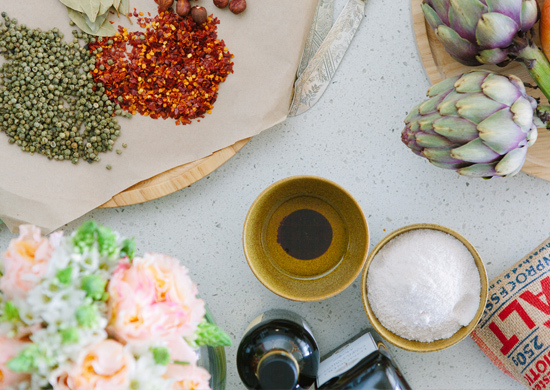 Here's our easy, step-by-step guide for creating a gorgeous dining experience. 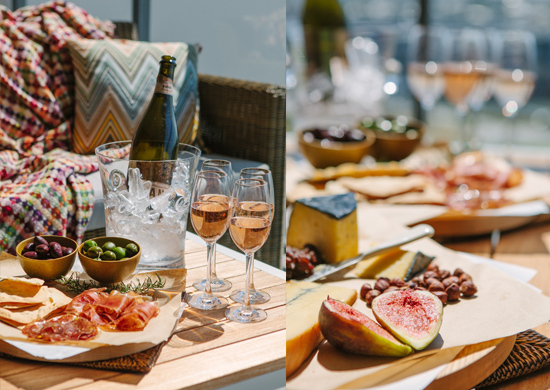 We think entertaining for family and friends should always begin with a glass of bubbly, and some delicious starters, and you cannot go wrong with a selection of hard and soft cheeses, muscatel raisins, nuts, charcuterie and fresh figs. 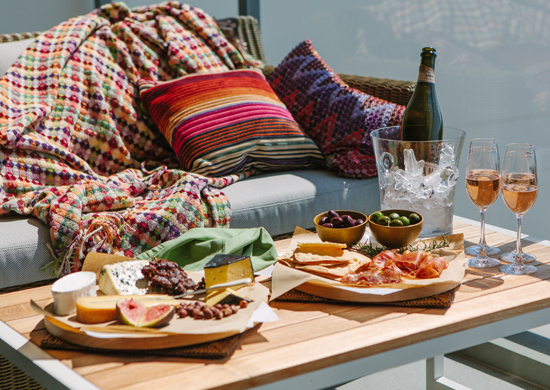 Missoni Home throw and cushions, and wooden platters from Ollie & Lloyd; cheeses, olives and charcuterie from The Standard Market Company; glass Zerutti ice bucket, Riedel stemware, and Jansz Brut Rose from The Wine Emporium Gasworks. Freshness is key, so pop to your local providore the morning of to track down your platter goodies. Gaswork Plaza's The Standard Market Co. ticks all the right epicurean boxes. They've lovingly curated this moreish pre-dining spread. Now to the bubbles: Choosing a rosé will add a touch of colour, both to the table and to your cheeks (it's called a festive flush), and beautiful stemware is always in style. Keeping things elegant and simple when choosing glassware is a safe bet. The Wine Emporium's gorgeous Riedel ice bucket and champagne flutes are a perfect example of simple design that suits any styling scheme. 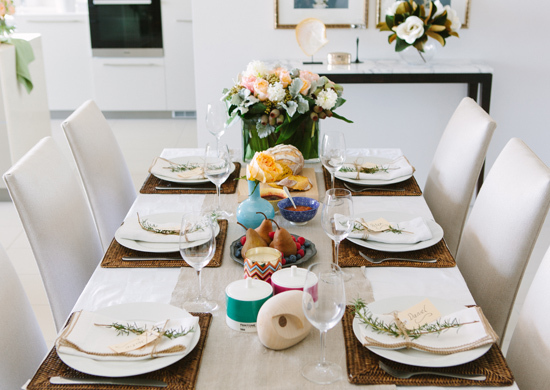 Missoni Home throw and cushions, woven place mats and wooden platters by Ollie & Lloyd by Olive Home; cheeses, fruit, olives and charcuterie by The Standard Market Company; glass Zerutti ice bucket, Riedel stemware, and Jansz Brut Rose by The Wine Emporium Gasworks. If you have an outdoor area, take advantage of the beautiful summer weather and take your drinks outside. (We were lucky enough to enjoy the stunning views from Mirvac's Park at Waterfront 14th floor apartment—talk about spoilt). It is easy to add a touch of luxe and colour to your pre-dinner setting with a few throws and cushions. We styled neutral outdoor furniture with some stunning Missoni Home soft furnishings, courtesy of Gasworks' design store Ollie & Lloyd by Olive Home, along with rustic wood serving platters. It's a well known fact that, when entertaining, it's no fun for you or your guests if you spend the whole evening chained to the stove. 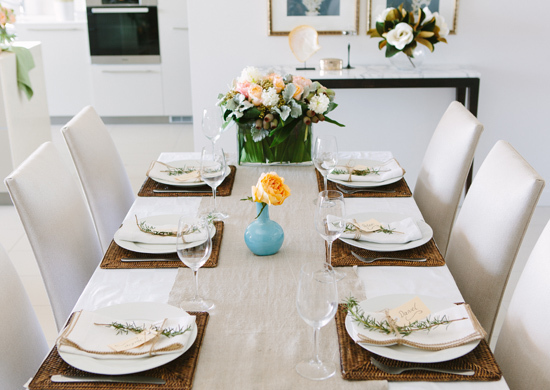 Instead, opt for a meal made up of dishes that can be pre-prepared (fresh seafood, cold soups, colourful salads) and/or can simply be thrown in the oven and forgotten about until the big reveal, which leaves you with your hands free to chat, mingle, and partake of some much deserved bubbly. Floral arrangement and vase by Gasworks Flowers; cooking ingredients by The Standard Market Company; wooden boards by Ollie & Lloyd by Olive Home. When you are busy in the kitchen preparing, there's no need to hide away from the group. Cooking and eating with your loved ones is what this event is all about, so invite them in and get them involved in the slicing, dicing and plating up. If they have a glass in hand, trust us, you won't hear anyone complaining. 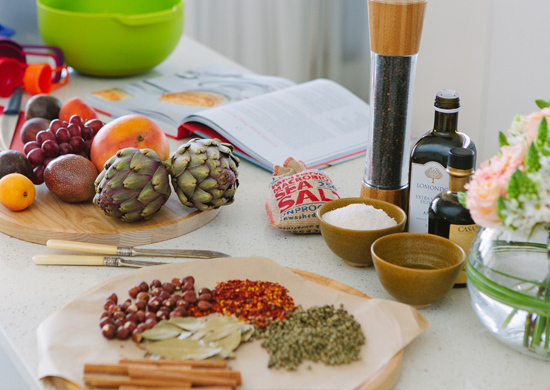 Floral arrangement and vase by Gasworks Flowers; cooking ingredients by The Standard Market Company; French cookbook, wooden boards, mixing bowls, cutting boards and knife set by Ollie & Lloyd by Olive Home. Treat your table as if it were a multi-layered dining landscape and build it up step by step. A neutral base acts as a blank canvas, which you then pepper with flourishes of colour and character. 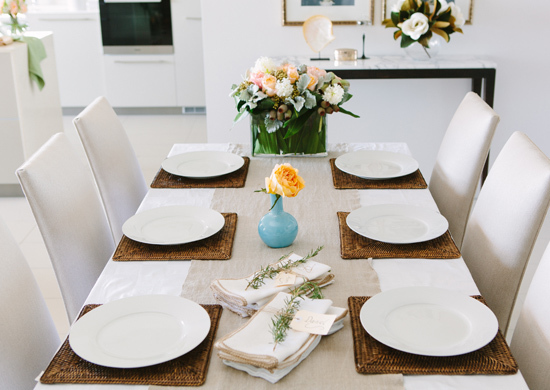 We've used fresh white linen with a hessian runner for contrast and texture, but if you are working with a natural wooden table, why not leave it bare? Book-end vases frame the table and provide a clear line of sight between guests. 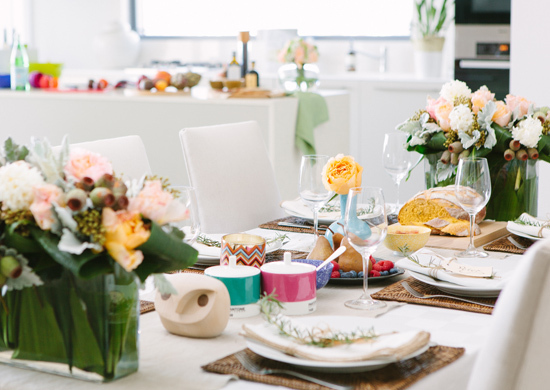 If you do place floral arrangements centrally, always keep in mind people need to be able to see across the table! Gasworks Flowers created these stunning table centerpieces using low-lying rectangle vases. A mix of traditional and native blooms fits with the eclectic feel we've chosen for our table style. Floral arrangement and vase by Gasworks Flowers; blue vase by Ollie & Lloyd by Olive Home. Next add the place mats and plates (this will help you judge how much space you have for dressing and condiments). 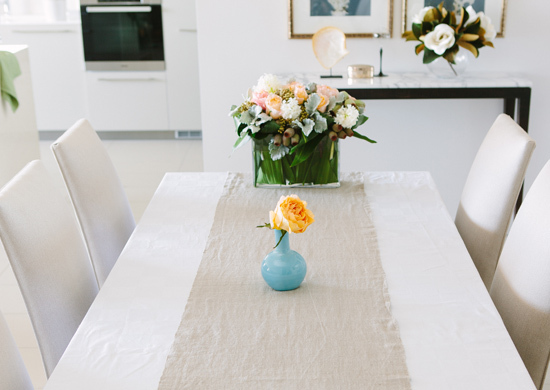 Floral arrangement and vase by Gasworks Flowers; white plating by Gasworks Woolworths; blue vase and woven place mats by Ollie & Lloyd by Olive Home. White plates are best for displaying food, (this is why food editorial usually features white plating!). We've chosen white ceramic plates from Gasworks Woolworths and woven place mats from Ollie & Lloyd for a punch of colour and texture. Cutlery, stemware and napkins should be placed next. 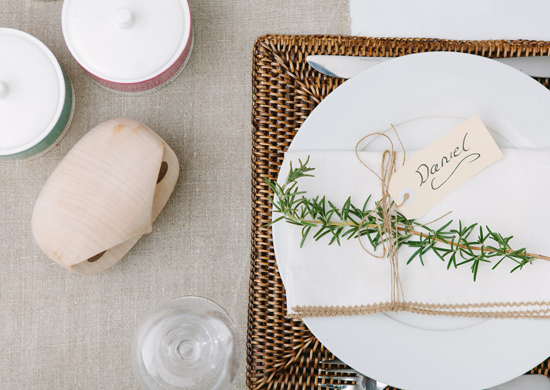 For a quaint and aromatic touch, add a sprig of rosemary or lavender to a personalised place card. Floral bouquet and vase by Gasworks Flowers; white plating and cutlery by Gasworks Woolworths; blue vase and woven place mats by Ollie & Lloyd; Riedel stemware by The Wine Emporium Gasworks. For the final flourish add your condiments and dressings. 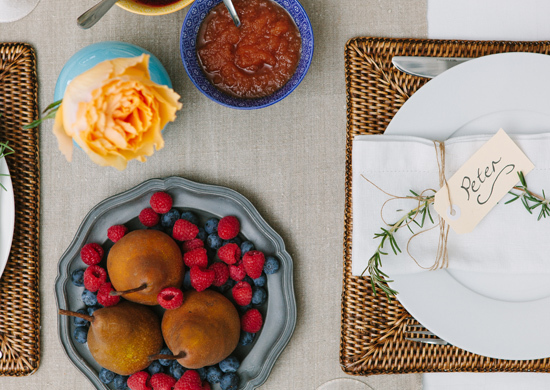 Bring the table to life, and add a touch of excessive festiveness, with lush fruits, spreads, and rustic bread loaves. Key designer items, such as the Ollie & Lloyd Pantone sugar bowls, dotted along the table add a touch of sophistication. Floral bouquet and vase by Gasworks Flowers; white plating and cutlery by Gasworks Woolworths; twine, calligraphy pen and card Gasworks Newsagent; blue vase, Missoni Home candle, Pantone sugar bowls, coloured condiment bowls, wooden owl and woven place mats by Ollie & Lloyd by Olive Home; Riedel stemware by The Wine Emporium Gasworks; fruit, condiments and bread courtesy of The Standard Market Company. Mixing old and new, and hand-made and store-bought adds personality and style to any table. Using vintage or treasured family items (such as the pewter fruit platter and hand embroidered napkins) mixed in with contemporary design pieces adds a touch of warmth and informality to your styling. We love the mix of the Missoni Home candle and Danish owl. Mixing neutrals with punches of colour and texture elevates the look of the table top. Floral arrangements and rectangular vases by Gasworks Flowers; white plating and cutlery by Gasworks Woolworths; twine, calligraphy pen and card Gasworks Newsagent; blue vase, Missoni Home candle, Pantone sugar bowls, coloured condiment bowls, wooden owl and woven place mats from Ollie & Lloyd; Riedel stemware by The Wine Emporium Gasworks; fruit, condiments and bread courtesy of The Standard Market Company. Gasworks Flowers created these beautiful floral arrangements using an array of hyacinth, David Austin roses and Australian native plants. The effect was modern and fresh—just the thing for an Australian Christmas. To seal the deal, and ensure everyone leaves suitably impressed, charm your guests with thoughtful personal touches. These personalised placeholders are a cinch to make, using twine, paper tags and a calligraphy pen. TUL Note: Today's List Love post is proudly sponsored by Gasworks Plaza and endorsed by The Urban List. Our sponsored posts will never be a secret - the List Love seal will be stamped on any sponsored material you see on the site. Thank you for supporting the sponsors who make The Urban List possible.